"Wow! It tastes sweet and creamy. Very surprisingly delicious." He said. "Hmph. It's almost banana-sweet - not bitter at all?!" I said. I had a few leftover kumquats and decided to juice them in my juicer with some peeled mandarins. 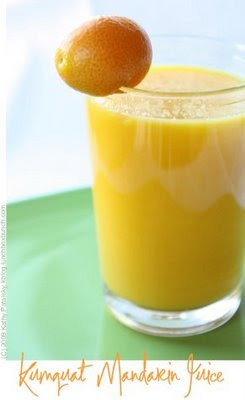 Have you ever tasted fresh kumquat juice? Rind and all? 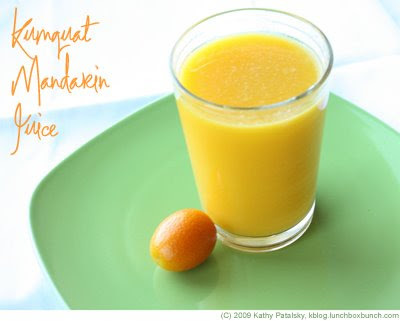 Using your home juicer, juice the kumquats first, then follow with the mandarins. It may be a tough squeeze to press the kumquats through, but trust me they will provide a nice amount of juice. It is creamy. Not bitter at all. This juice would taste amazing blended with a few bananas and ice. Blended with vanilla soy cream would make an amazing "creamsicle" type flavored soy-shake. More about KUMQUATS here on my blog.